The first, and by far the most important thing about tacking in waves is that you should try not to do it. Tacking is costly enough under the best circumstances, but when you make a maneuver like this in choppy water you lose a lot. Of course, many races are sailed in rough seas and you have to tack somewhere! In that case your goal is to find spots that are relatively smooth (see right) so you lose as little distance as possible relative to your competition. One of the best strategies for a successful maneuver in waves is to tack when you want to, not when you have to. If you decide to leebow a starboard tacker, for example, you must turn in one particular spot, and that’s slow if the waves happen to be bad there. Abetter strategy is to sail the beats so you can tack when and where you want to since the distance you gain by tacking in flatter water can be significant. Though waves are bad for tacking, they can actually be very good for jibing. 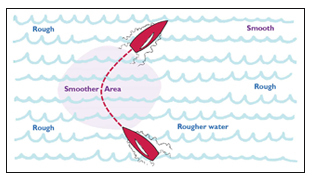 While you are surfing down a wave, the boat is stable with less wind pressure in the sails. But in light wind, waves make it harder to keep flow attached to the sails and to accelerate after the jibe. 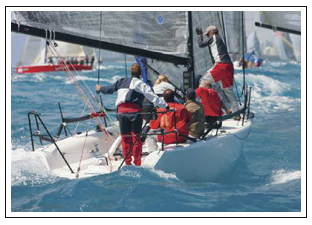 • Make sure you have good speed before you tack – One of the worst things you can do is to tack when you are not going full speed upwind. So don’t tack during a lull, while you are pinching or just after hitting a set of bad waves. In many cases it’s actually better to be going slightly faster than normal when tacking. • Turn a little faster than usual – The slower you turn through a tack, the bigger your chance of hitting a bad wave in mid-tack (the worst time to hit a wave). So speed up your rate of turn slightly, especially the part of the tack where your are head to wind since this is when your hit the waves most squarely. • Turn a little farther than usual – When you come out of the tack you’ll need extra power to accelerate in the waves, so make sure you come out a little ‘fat’ (slightly footing) rather than a little ‘thin’ (slightly pinching). These sailors are hoisting their spinnaker, but this would also be a good place to jibe. When it’s windy, jibe when you are surfing down a wave (i.e. when your stern is higher than your bow and the boat is sliding downhill). The speed you gain when surfing on a wave will decrease your apparent wind pressure, unload your sails and make the boat more stable. In any case, be patient until you find a good place to jibe. Once you do, be decisive and go for it. Hesitation often leads to disaster.